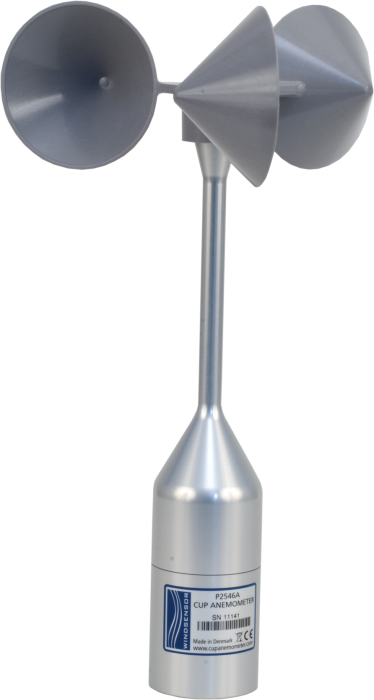 The P2546A, manufactured by WINDSENSOR, is a Class 1 anemometer often used for wind speed resource assessment and wind turbine power performance monitoring. Wind speed is sensed by a three-cup rotor assembly. Magnets mounted on the shaft cause a switch to close and open two times per revolution. Our data loggers measure the switch closure and convert the signal to engineering units (mph, m/s, knots). The anemometer is mounted using the 27739 30-inch mounting pole. The P2546A comes with a MEASNET calibration certificate. The P2546C (coil version) is also available. The P2546A is constructed with durable anodized aluminum and stainless steel. Its switch has no bounce and has a mechanism that reduces the variation in operating time over the frequency range. -NOTE- The specifications are based on 80 wind tunnel calibrations performed according to the Measnet Cup Anemometer Calibration Procedure. The specified offset and gain figures represent the mean values of these calibrations. Variation among units designates the maximum deviation of any unit from the straight line representing these mean values. All units are run-in for 225 hours at 9 ms-1, in order to reduce the initial bearing friction to a level close to the steady state value. After run-in, bearing friction is tested at -15°C and at room temperature. The allowed limits for this test assure that the temperature influence on the calibration is within the specified limit. Can a MEASNET calibration be obtained for a P2546A-L? Yes. Every P2546A-L ships with a MEASNET calibration certificate. Does the P2546A-L have a mercury switch? Yes. Campbell Scientific recommends checking the local regulations to ensure that mercury switches are usable in the intended area. If a sensor without the mercury switch is required, contact us for assistance with ordering the P2546C-L.